Shivaay and Anika are standing,hugging each other.Time is passing but they are not ready to free each other. Anika,who has buried herself completely in Shivaay’s arms,tells in half-whispering voice-Hmmmm…? Shivaay:I think you should tell something else too.You know it’s been long since you talked and I am really worried.Anika retreats from the hug. 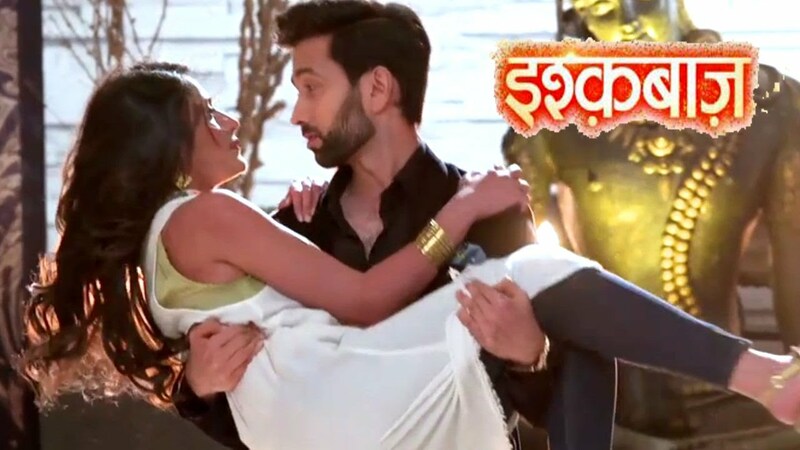 Shivaay:Hope I am safe now from your wrath!Anika hits him on the shoulder. Shivaay:Tell something?Are you happy or not? Anika:When I made this,little did I know that it would be gifted to me that even by my husband.This piece is really beautiful.I loved designing it.You know Shivaay,I named this bracelet. Anika:Are you seeing these little moons hanging down here?Because of those I named it Chaand bracelet.She smiles. Shivaay:Your smile always stirs something in my heart,every time. Anika:Sorry I did not hear what you said. Shivaay:N..Nothing.I am just happy to see you happy and smiling. Anika:I wanted to ask you a thing but forgot.Shivaay,why did you buy it?When or on what occasion? Shivaay:Do I really need any occasion to gift you?I don’t think so. Shivaay:Anika,have…have you found the note? Anika:What note?You left a note inside the box for me to find? I see,you wrote it after raking your brain so much then must have crammed something unromantic,going by your nature.Anika complains. Shivaay:You…You want to say that I am unromantic? Are you sure Anika?Because I have many many proofs to prove you wrong.Saying that,he starts caressing Anika’s face,using the magic of his fingers and her heart beats go fast,breathing heavy. Shivaay:You are yet to discover that extreme Romantic side of Shivaay Singh Oberoi.And trust me Anika when I say this-Shivaay Singh Oberoi will make sure that you discover that part! Anika:I am sorry Shivaay.Because of me your lunch and afternoon,both got spoiled. Shivaay:If I say no,it was not then? Shivaay:I have a very important work to finish and only you can help me.Will you? Shivaay:Read once before signing.One should always read before signing.Go through the papers Anika.Don’t you want to know what you are signing? Anika says smiling-You have read na? Anika:Then I won’t read.I don’t need to. Anika:I have signed papers as Anika Vardhan Trivedi.I forgot how I used to sign using Oberoi title of mine.Can you replace the papers? Shivaay:It’s absolutely okay.Be it Trivedi or Oberoi,it’s you,Anika,who matters.Not any title or surname.I got your name and that’s enough. Anika hugs Shivaay side-way then says-You are really my Sweet Singh Oberoi.He laughs holding Anika.Their talks continue ahead smoothly. Finally Anika takes leave from Shivaay and heads for Sunflower Petals in car.He goes back to cabin after sending Anika off,personally. P.A:Mr.Harshvardhan Trivedi has come to meet you sir.He is waiting for you in the guest room. Mr.Trivedi:I wanted to meet you Shivaay.I am sorry that I came without informing you dear.But it was urgent. Shivaay:Plz don’t say sorry.Even me too wanted to meet you. Mr.Trivedi:I guess it’s going to be a long talk.Let’s have a seat.What say young man? Shivaay:Of course.Plz come.They both sit face to face. Shivaay:Would you like to take something? Mr.Trivedi:Maybe later.This time I just want to talk.I think you know on which topic we will discuss. Mr.Trivedi:See dear,Anika is my eldest daughter and I love her more than anything else.Recent time was tough for me and for my family.Perhaps you don’t know but there was a problem and that created a lot of difficulties for me,my family especially for my dearest Anika.And…He stops sighing. Discussion goes on.Almost three hours later Mr.Trivedi leaves the Delhi office of the Oberois.After his departure,Shivaay too leaves for home. Rudra:Hello Madam,what are you doing here? Soumya:Why?Are you some type of VIP that I must hear you? Soumya:I agree completely.Among those girls who are dieting freaks,mini,short dresses ki dukan,beauty without brain,cat-walk queens.Did I miss some point Mr.Ladies’ VIP Oberoi? Rudra:Listen,you are insulting me.Last time I said nothing because of Shivaay bhaiya and Anika di.Because I respect them a lot.But I am warning you.Don’t provoke me Ms.Lady Doctor.I mean would be. Soumya:Have I asked you to talk to me?I have never seen such a gale-padhu insaan like you. Soumya:Tumhara naam Rudra Oberoi nahi,Duffer Oberoi hona chahiye tha.Stupid. Rudra:Ek toh maine tumhari help karne keliye roka ulta tum mujhe hi suna rahi ho.Mujhe rokna hi nahi chahiye tha. Soumya:Why did you stop?I have not called you. Rudra:My fault.It’s almost evening.You won’t get any mechanic here.Come and sit in my car.Our destination is same.Main itna bhi bura nahi hoon.You can trust me. Rudra:Seat-belt.Soumya fixes it and car moves on…. Precap:Shivaay and Anika are talking.Phone rings and taking that Shivaay shouts-What? ##Thank you,thank you sooooooooooooooooooooooooooo….very much my darling readers for all the love.Love you all.